“With Soft Armor, the idea was to dress a woman in clothes that cover and protect her and at the same time, I wanted to give to rigid and heavy fabrics a certain lightness”, explains Lutz. 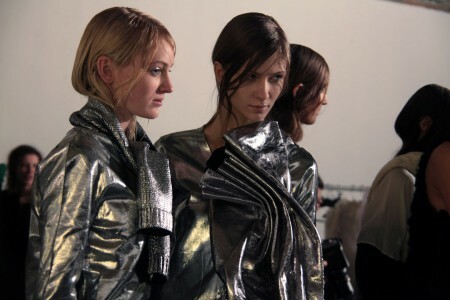 In this particular state of mind, softness and harshness react with and against each other: fluid silk dresses team up with deconstructed coats and jackets, soft knits and cashmeres are printed with a silver film, that creates an iridescent effect, coming close to the idea of wearing pieces of armor. A concept that was obviously appreciated by the public, as buyers and press immediately rushed into the backstage after the show to compliment the designer. “It is always a weird feeling, working on a collection for 6 month feels like going through a black tunnel and when you finally reach the exit, you never know if it is going to shine or rain outside!” Well, considering the cheerful acclaims in the backstage, we’d say that the weather is more than gorgeous this time!